As the evenings cool and the chance of frost increases, having vegetables growing in cold frames or under row covers will prolong their productivity. A cold frame is essentially a bottomless box made of wood, brick, or concrete block sides with a removable or hinged top of glass or thick clear plastic sheeting. Some are elaborate while others are made from repurposed materials such as old windows and scrap wood. 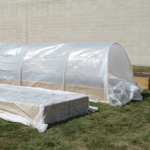 Row covers sit over a single vegetable row and are made with a hoop frame that is covered with clear polyethylene or spunbonded polyester or polypropylene. Medium weight plastics or polyester work best as anything thinner doesn’t offer frost protection, and anything heavier blocks too much sunlight. 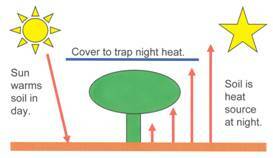 The purpose of both cold frames and row covers is to warm the soil and trap warm air at night. Positioning a cold frame so that it faces south on a hillside will keep the soil warmer in the fall and warm quicker in the spring. Remember that if your land slopes, that cold air settles in the lowest areas on calm nights and can create frost pockets. 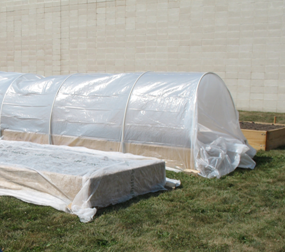 Cold frames and row covers will also lessen the effect of chilling wind. The tops of the crops should not touch the top of the cold frame or the plastic of the row cover. If they touch, the frost will damage those areas. Although it might be cold at night, the top of the cold frame and the plastic of the row cover should be removed on warm days; otherwise, your plants will overheat and die. A thermometer inside your frame or cover will help you stay aware of temperature changes. If starting your vegetables from seed, some fall vegetable seed will not germinate if the soil is too warm and might do better started inside. With spring gardens, the converse is true, the soil is often too cool, and the seeds do better begun inside giving them a head start on the season. Remember to harden the seedlings off when transplanting them outside. Enjoy this fall vegetable season in the garden and later, in your kitchen.